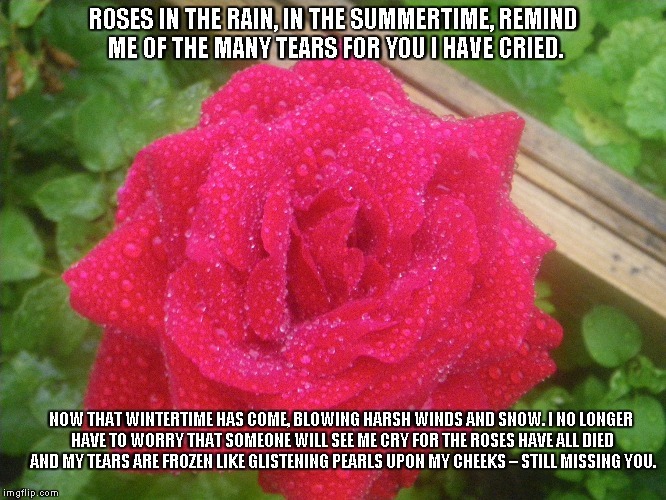 ROSES IN THE RAIN, IN THE SUMMERTIME, REMIND ME OF THE MANY TEARS FOR YOU I HAVE CRIED. NOW THAT WINTERTIME HAS COME, BLOWING HARSH WINDS AND SNOW. I NO LONGER HAVE TO WORRY THAT SOMEONE WILL SEE ME CRY FOR THE ROSES HAVE ALL DIED AND MY TEARS ARE FROZEN LIKE GLISTENING PEARLS UPON MY CHEEKS – STILL MISSING YOU.